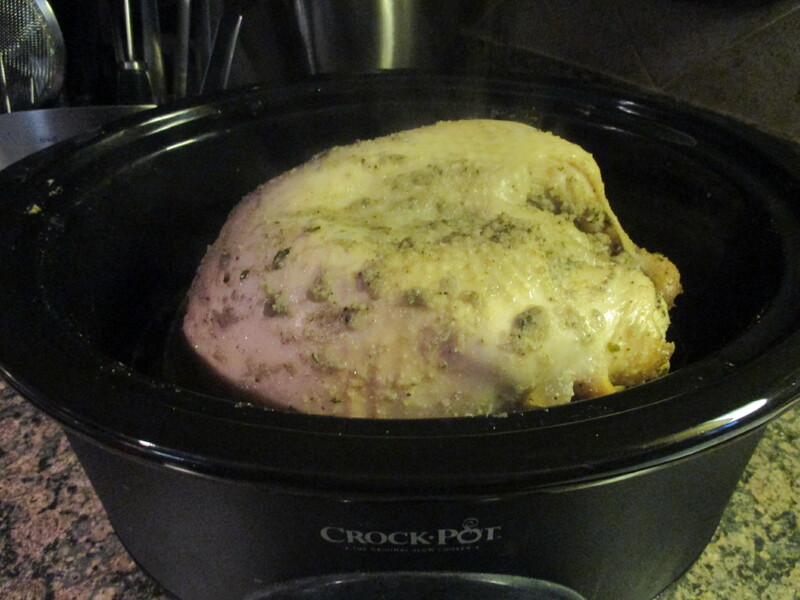 Have you ever thought about cooking your Thanksgiving turkey in a slow cooker? Well, unfortunately you can’t put a whole turkey in there, but, you can cook a turkey breast. Believe it or not, they actually say slow cooker friendly on the wrapper, well, at least the one I picked up did. 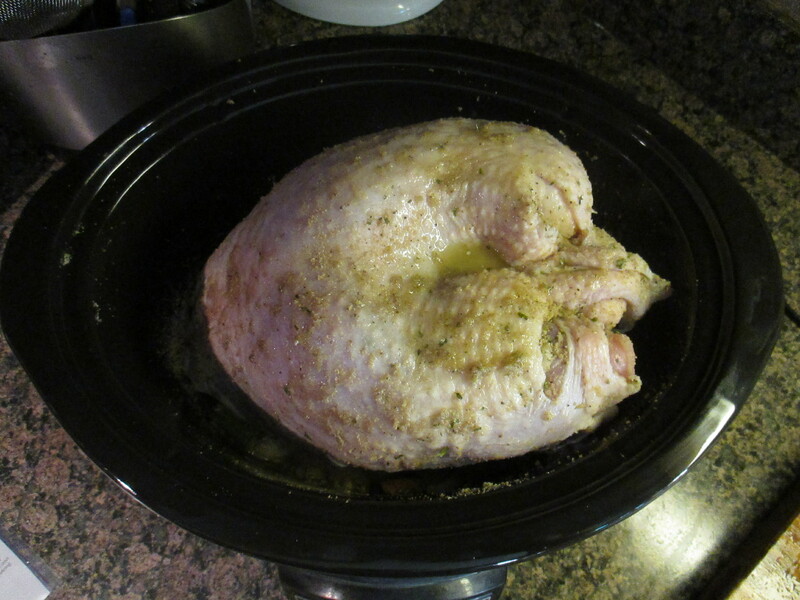 My friends and I had our 2nd Annual Friendsgiving Celebration last weekend, and when I offered to bring the turkey in my mind I was already thinking of a slow cooker turkey breast since there wasn’t going to be that many of us. I decided on a turkey breast that was 7.5 lbs. 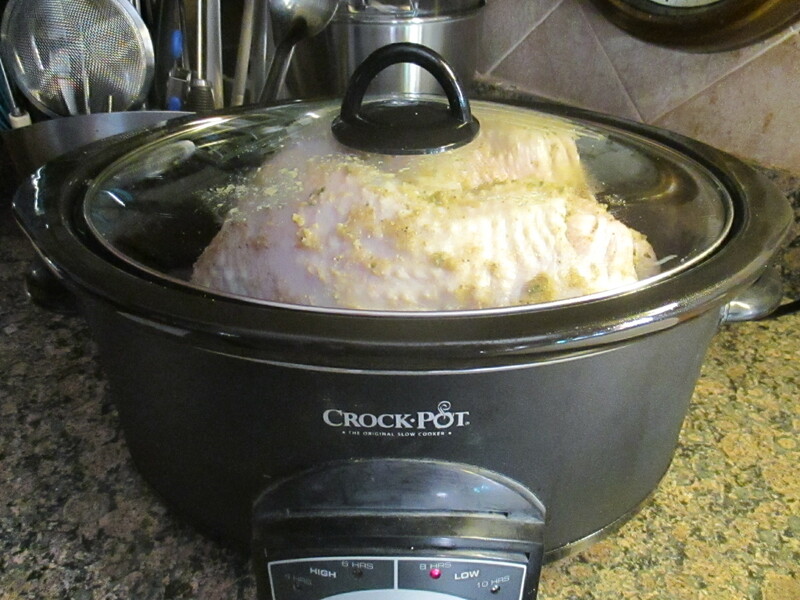 Now, when I brought him home and tested him out in my slow cooker I freaked out a little bit because he didn’t fit. Well, he fit I just couldn’t put the cover on the slow cooker. But, I thought to myself that once he thawed out he should just fine. On the day of the get together I got up early just in case it took longer than directed and in case of any other mishaps. I began by placing a chopped carrot, onion and celery in the bottom of my slow cooker. I then placed the turkey breast on top of the vegetables and sprinkled him – oh, and yes, I always refer to my turkey as him or he, it’s because of Tom The Turkey – with an herb and spice mix and then drizzled melted butter over him. If you don’t have the specific spices that I used below feel free to create your own spice mix. After a little coercion I was able to get the cover snug on top and I set him to cook on low. I was planning on him being done between 6-7 hours. While the pop-up time did pop out at 6 hours I decided to leave him in there a little longer just to be sure. I figured he wouldn’t dry out in a slow cooker. And unfortunately the one downfall of cooking a turkey in a slow cooker is not getting that nice browned skin. 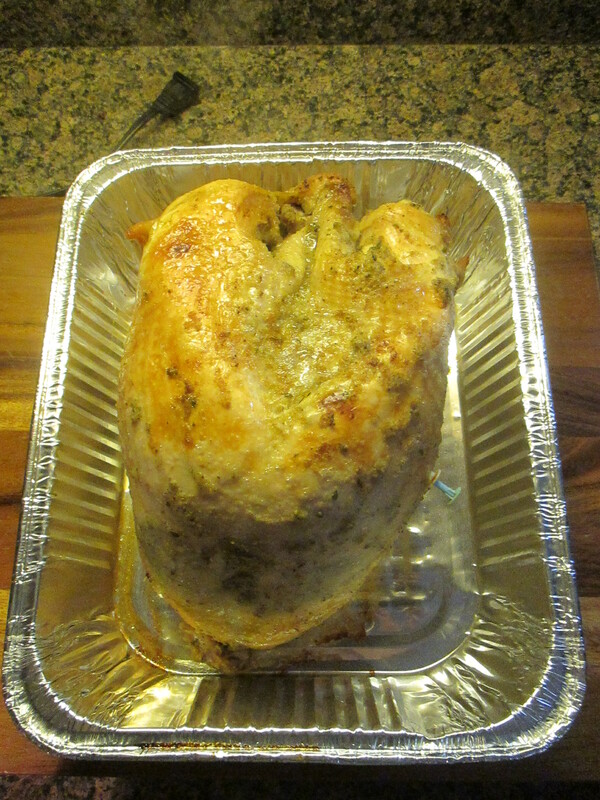 But, that was nothing that a few minutes under the broiler couldn’t resolve. So, would I make a turkey breast like this again? Yes! It’s stress-free and pretty much guarantees that you will have a juicy turkey. I am tempted to go my usual route of brining the turkey beforehand next time though. Oh, one thing I was able to make with this turkey that I had never been able to do before was gravy. There was a decent amount of drippings left in the slow cooker and I must say, homemade gravy from the drippings beats anything you buy in the store hands down. In the slow cooker toss together the carrot, onion and celery. In a small bowl mix the herbs and spices. When the turkey is done, preheat the oven to broil and place the turkey in a roasting pan and broil for a few minutes to brown the skin. Don’t leave it in the oven too long or the turkey could dry out. Combine the cornstarch with 2 tablespoons of water. Strain the remaining liquid in the slow cooker into a medium saucepan. Bring to a bowl over medium-high heat. Whish in the cornstarch mixture and cook until the gravy thickens. Slice the turkey and serve with the gravy.